This small New Zealand based drama is a cinematic milestone in many ways. It was the screen debuts of two teenage girls named Kate Winslet and Melanie Lynskey. Winslet went on to fame an fortune with Titanic and numerous other big roles. While Lynskey is mainly known for playing Rose on the TV show "Two and a Half Men". Although she is nearly unrecognizable as that character in "Heavenly Creatures". It was also the breakout film for director Peter Jackson, who had previously done a few nasty but amazing horror films. "Dead Alive" is a cult classic. 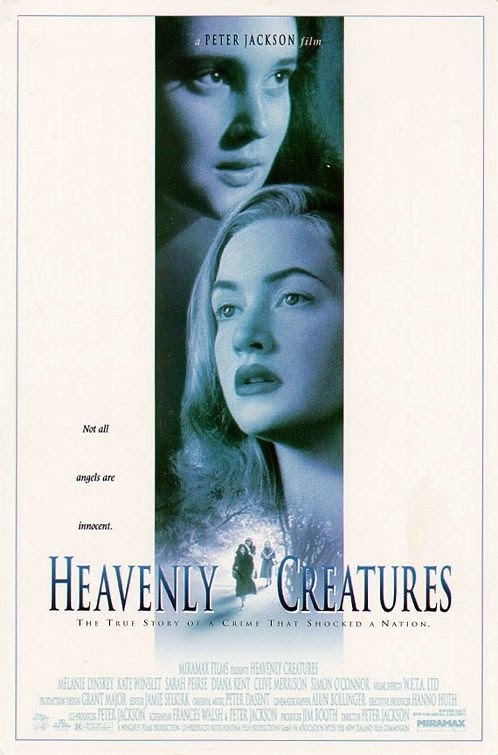 "Heavenly Creatures" is based on a true story of two teenage girls, Pauline Parker (Lynskey) and Juliet Hulme (Winslet) who in the 1950s develop an intense bond living their lives in a fantasy world. When their parents feel that their relationship has become a little too intense and "unhealthy" their attempts to separate them drive the girls to unthinkable lengths. Juliet is a rich privileged girl who has just moved with her family to Christchurch, New Zealand from England. Upon attending the all-girls school she develops an immediate bond with the withdrawn and homely Pauline. They both share a love for the Italian tenor Mario Lanza, and quickly create a unique world of their own, with clay figures that come to life and dreams of becoming royalty. Although Juliet's seemingly perfect life is anything as her parents don't seem to care for her, as they are always either going off the other countries or sending her off to live in far-off lands. Both girls are terribly lonesome and lose themselves in each other. Pauline's religious-minded parents take her to a doctor fearing she has some sort of "gay disease". Conversely, Juliet's parent is extremely liberal with few if any religious beliefs. The girls' physical worlds start to crumble as Pauline's mother's affair comes to light and a divorce closely follows. Juliet also learns that she is being sent to South Africa to live with an aunt. This impending separation leaves them inconsolable and desperately making a plan to stay together. The ending is intense and extremely disturbing in its realistic depiction of these girls driven to the brink and finally breaking. "Off The Map" is out of this world!